In the past few months of my silence I have undergone many major life changes. New housing, moving, being extremely sick (twice), traveling, new job position, new vehicle, major choices, etc. With all of this mental exhaustion and just the weight of the stress of adulthood where it seems most of my conscious hours are spent worrying about this bill or that errand, I have greatly neglected the things that simply make me happy. One of the greatest, cooking. More specifically, baking. I can’t say that I haven’t been happy these past few months. These are great things that are happening, and even though my pile of bills is every growing, so are my opportunities in life. This had me thinking about cycles and seasons. Take a tree for instance, one of my favorite examples of life, the different seasons come and there is nothing that tree can do but continue to be a tree. It will still grow, deepening its roots, being strengthened through the harshness of winter, sweating through the (Texas) summer, removing the old excess in autumn and bearing fruit in the spring. This encourages me in a deep sense, knowing that I too am like a tree and that this too shall pass and something else will come along, good and bad, but I will be better for it, I will continue to grow and I will keep on being me. That being said I was so inspired last week to bake a cake, prompted by my stomach and motivated by my taste buds. This cake showcases some flavors of the earth and of this current season, summer. There is an abundance of fresh fruit in season, nuts, flavors, inspiration. When I realized that this was something that I wanted to do for myself, in the midst of never ending adulthood, these were the flavors I wanted to utilize. From seed to flower, to pollination and finally fruit, this cake encompasses the flora life cycle. Makes 16 servings. About 2-3 hours active cook time, depending on skill level. Preheat oven to 350F (325F if using dark non-stick pans). Grease 2x 9″ round baking pans and line the bottoms with parchment paper. Set aside. Sift the flour, almond flour, baking powder, baking soda, and salt together in a large bowl. In a mixing bowl, cream the softened butter and sugar together on a medium speed using the paddle attachment. Cream for about 2-3 minutes or until well incorporated and airy. Add the eggs, one at a time, and continue to beat for another couple of minutes until lighter in color. Then, add in the honey, vanilla and almond extracts and beat until combined, careful not to over beat. Set mixer to lowest speed and slowly add the dry flour mixture in thirds, adding in half of the yogurt to the batter in between each third of the dry mix. Finish by hand mixing to make sure everything is fully incorporated and well mixed. Divide the batter in to the two prepared baking pans. Drop the cakes from about a foot about the counter to flatten out any air bubbles and level out the batter. Bake for 25-30 minutes, or until a toothpick inserted comes out clean. Completely cool the cakes. While the cakes are baking, get started on your icing. *if you want to really amp up the lavender flavor, soak 1 tsp. lavender buds in the milk overnight. Strain before using. Beat softened butter and honey together until light and fluffy. About 2-3 minutes on medium speed with your mixer. Add the sugar and then the milk, continuing to beat until silky and blended. Stir in the salt and set aside. Melt the butter over medium heat in a heavy skillet. Continue to cook butter 6-10 minutes until brown, swirling or stirring frequently. Do not burn the butter. If it even smells a tinge burnt, toss it out and start over (it doesn’t not taste pleasant!). Once brown, immediately remove from heat and add the brown sugar and peaches. Just stir enough to coat the peaches, about one minute then pout into a bowl. You do not want to cook the peaches, just very lightly bring out the natural sugars. Mix together the cornstarch and water into a slurry. Add to the peaches. Once cool, strain off all excess liquid using a fine mesh strainer. Delicately level off your cakes using a large serrated knife such as a bread knife. Carefully slight each cake round in half, created 4 equal cake layers. On the bottom layer add half of the peach filling, top with 2nd piece of cake. On the 2nd layer, spread the buttercream and add the 3rd layer of cake. On the 3rd layer, evenly add the remaining peach filling. Top with the final cake layer and completely cover in icing, any way your prefer to ice your cakes. I like a clean look. 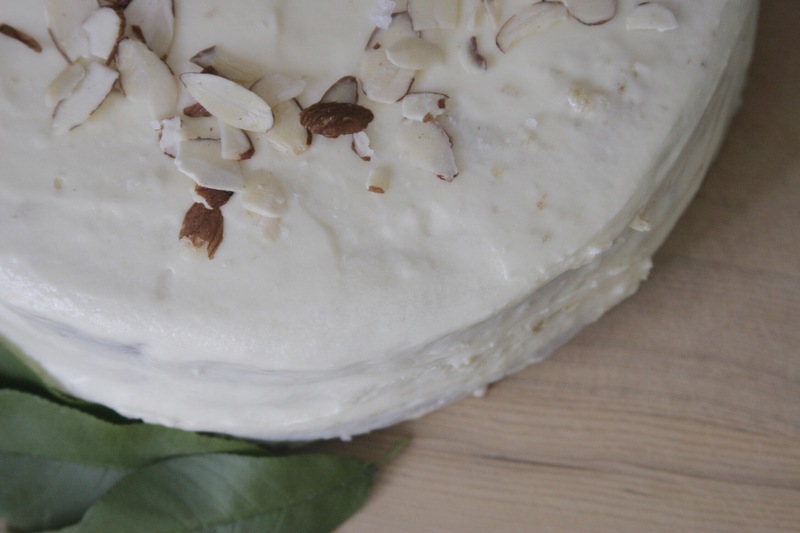 Top off icing with more Malden sea salt and raw or toasted slivered almonds (I love that crunch!). You can use bee pollen, edible flowers or any garnishes of your choosing. Serve and enjoy within 4 days, store covered in the fridge. I hope you enjoy the natural flavors of the seasons of the earth as much as I do. The almond, honey, lavender and peach. The sea salt really sets off the cake and helps balance out the sweetness so you can really savor this dessert. And if you were wondering, baking this cake was one of the most enjoyable things I’ve done in such a long time. It was deeply therapeutic and a momentary mental escape. But most of all I had so much fun creating and testing out this cake recipe. To me, cooking is the most involved art form and it can be enjoyed and experienced by many, not just the one cooking. Thus, cooking is my favorite creative outlet, where I come alive the most, experiment beyond the normal and is an art form that allows me, or anyone, to involve all five of the senses from conception to consumption, plus the use of intuition and a sense of inner gratification (from your stomach and your heart). So I guess more than five senses.